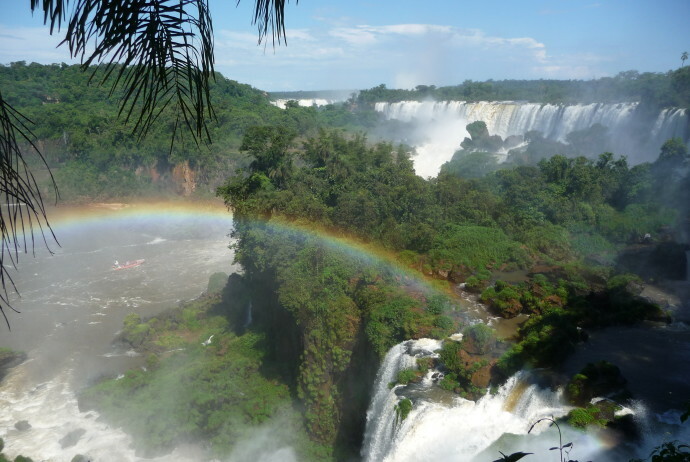 When boarding our plane to Foz do Iguaçu last Sunday we found ourselves joined again by fellow backpackers which all were excited like us to see one of the new seven wonders of Nature: the mighty Iguaçu Falls. We had enough time here to see the falls from both, the Brazilian and the Argentinian side, to eat some of the best meats we ever tasted and to explore some of the other sights in and around the city. The first day we spent chilling at the hostel’s pool area and exploring the town a bit on the search for an open restaurant to have dinner at. This turned out to be quite a challenge, as most restaurants are closed on Sundays. The next morning the bus 120 delivered us directly at the entrance of Iguaçu National Park. This park on the Brazilian side gave us the big picture panoramic perspective on how vast the whole area of the falls really is. We wandered along the trails, enjoying the breathtaking views. This would have been a purely peaceful activity if it had not been for the mean little beasts called coaties, frequently attacking us from ambush to steal the cookies from our backpacks. We solved the problem by eating all the cookies ourselves and were thus able to continue blissfully along the park’s path. 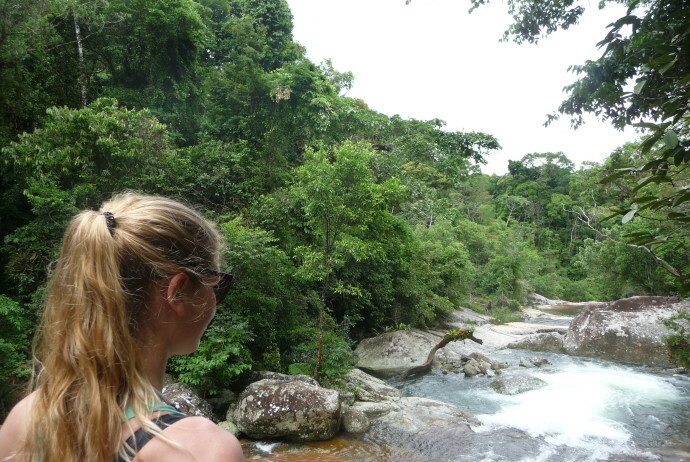 Supposedly, waterfalls make people happy by producing negative ions. We don’t know whether those ions, the sheer amount of cookies we ate or simply the sight of this glorious natural wonder were the reason for our enthusiastic jollity, but in the end, who cares. Pushing the edges of an already perfect day to make it even more amazing, we had dinner at the churrascaria Bufalo Branco, where we spent hours joyfully giggling while enjoying the best meats we had ever tasted in our entire lives (seriously, no exaggeration here!). The next day our exploration continued on the Argentinian side. As recommended by our hostel’s staff, we booked a guided tour in order to ease the boarder crossing formalities. However, we had not considered that this would also encompass having to run after our guide Juan, holding up a yellow flower-patched umbrella. As this crossed seriously with our idea of a good day, our paths quickly separated from the group to explore the park at our own pace and preferences. We discovered the falls from various different but all impressively beautiful close-up perspectives: we went on a speed boat ride which took us near enough to the falls to get a thorough shower, a welcome cool-down; we hiked different trails in the park and looked down into the devils throat, the “garganta del diablo”. The following day we went to see “Parque das Aves”, the bird park of Foz do Iguaçu, to see some toucans, flamingos, parrots and other feathery creatures. We used the rest of the day to stroll through town and expanding our list of “must-try” Brazilian typical snacks, the much loved “Salgados” and “Dulces”. Due to our exhaustion caused by the heat and all the rather sugar and grease loaded foods, we had to stop at every happy hour offering bar along the way back to our hostel. This helped to recharge our energy enough to make it back “home” eventually. On our last day we reloaded our backpacks, stocked up on bananas, chocolate, cookies and water and boarded our bus to Buenos Aires. Argentina here we come! What to see: The main sight really are the falls, but make sure to see them from both sides. Still marked badly from the blood-thirsty vampire mosquitoes of Ilhabela, but confident to survive any other mosquitoes thereafter, we arrived in Ubatuba. We had decided to come here not only due to the city’s awesome name but also because it offers more than a 100 beaches, some of them among the best in Brazil. As our first day started out quite rainy, we decided to drive to Paraty, a nearby charming little city with a beautiful old town area full of historic buildings and souvenir shops. Some of these have a clear specialization: the famous local Cachaça of which they carry a myriad of different ones. When we had tasted and bought enough Cachaça the day brightened up and eventually even the sun came out a bit. Thus we decided to visit the magnificent beach of Trindade. Here people can stroll along the beach or relax in the “natural swimming pool” formed by the ocean. By the time we got back to Ubatuba, we were full and satisfied with all the day’s impressions, but physically starving, so we opted for a local favorite: Pizza – and because we felt super hungry: Pizza Rodízio (all you can eat pizza). 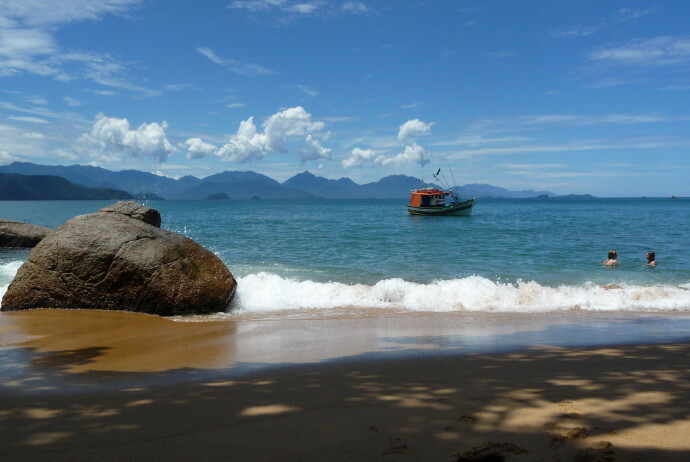 The next day we decided to visit Cedro beach, a small beach strip located in the midst of the rainforest which made the list of the top beaches of Brazil. This is a hidden oasis, with a small restaurant and a tiny place renting out snorkeling and other water equipment. On our last day we went to Vermelha beach, a popular surf spot in Ubatuba, which by the way is known as the “surf capital” of the region. Relaxed and tanned, almost like locals, we then made our way to the city’s bus terminal: After all São Paolo was already waiting to be explored. Where to stay: Pousada Residencial Vista Mar – a great option for everybody who likes to wake up to breathtaking ocean views. Where to eat and drink: Pizzaria Sao Paulo – we know: Ubatuba for sure has plenty of awesome restaurants but for some reason we always ended up with having Pizza (which is nothing to be ashamed of here – the locals LOVE pizza!). This place was our favourite though. What to do off the beaten track: Cedro Beach – a swimming, snorkeling and stand-up paradise. … probably though, only according to the number of inhabitants. To be honest, São Paolo does not convince with looks and chances are not very high to fall in love with it at first sight. Therefore, it is not a common backpackers’ destination. However, it still came as a surprise to us that we were the only guests at the hostel we had booked. We have never experienced having a hostel all to ourselves, so for anybody eager to have that experience too, go try São Paolo. But the city does offer some more reasons to visit: the Mercado Municipal was probably our favorite. Some trustworthy “Paolistas” (that’s how the locals are nicknamed) told us that it is pretty much obligatory to taste one of the famous and frighteningly mighty “Brazucas”. These prize-winning sandwiches are filled with a ridiculous amount of mortadella and are sold by the restaurants on the first floor overlooking the busy market hall. Patrick and I (that is Nicky in this case) shared one of them and could hardly walk afterwards. But this is efficient eating for sure: until late in the evening we did not feel the faintest bit of hunger. In order to recover from this feast, we layed down in the shades of Parque Ibirapuera. By the time we had digested it at least partly, we refreshed ourselves with a “Sorvete”, a fruity popsicle delivered to lazy park visitors by busy sellers carrying around their coolers throuh the park. In the shades of the trees of Parque Ibirapuera we almost forgot for a while that we where in the midst of a city, home to more than 12 million people! 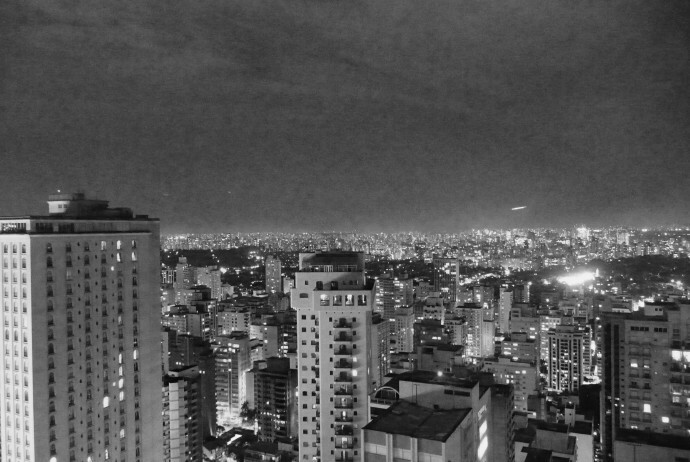 Despite its lack of beauty during the day, São Paolo convinces with a myriad of restaurants, bars and night clubs to choose from. There are so many, it was a hard choice to pick one. But we ended up with a lucky pick, having dinner at Tomyam, a great Thai restaurant. After one full day in São Paolo, however, we all were not unhappy to leave again to set out for our next destination: Foz do Iguaçu. Where to sleep: An adventurous backpacker’s option is the Sports Villa Hostel. And for those seeking more comfort and luxury, the Central Park Flat Jardins is a good choice. Where to eat & drink: Tomyam – delicious Thai food in a stylish atmosphere. Where to party: D-Edge – the place to be after midnight. What to do: Mercado Municipal – an experience for all senses. The first thing we did when arriving in Rio was to strip off our winter jackets: even at night it was about 30 degrees warmer than in Rome, where we had departured from. We spoiled ourselves with staying in a hotel right at the Copacabana. Our first day in Rio was pronounced a lazy beach day on which we thoroughly compared the two most loved beaches of Rio: Copacabana and Ipanema. Our evaluation included various parameters: the beach itself, the color of the ocean, the waves, the views and of course the frequency of Caipirinha sellers asking if we needed a refill. We prefered Ipanema (just like most locals do) but we advise everyone to make his own judgment. The lazy beach day was perfectly rounded off with enjoying a marvelous sunset on Ipanema beach. People here love their sunsets and applaud the sun when it does a good job with coloring the sky in all shades of gold, red, orange and yellow. Trusting the advice of some locals, we set out to hike up the “Trilha Dois Irmãos” the next morning. In order to do so, we took a bus to Vidigal, but somehow ended up in Rocinha, one of the largest Favelas in Brazil. Luckily however, with a little help of some friendly Cariocas (as locals are called here), we made our way to Vidigal, where we switched to another local transport system: motor taxis. For R$5 which equals about €2, some guys provided us with a helmet and brought us up through the Favela to where the hike begins. My driver took me on a nice and relaxed sightseeing tour, trotting behind Lisa’s and Patrick’s fast and furious bikers. Eventually though, we all arrived and started our way up the path to the top. After 45 minutes, we could enjoy a stunning view over the “marvelous city”. In the afternoon, we explored the charming districts Lapa and Santa Teresa where we had a typical Brazilian dinner, followed by a couple of typical Brazilian drinks. During the next days we got to enjoy some more stunning views from the Corvcovado and the Sugarloaf Mountain. Another highlight was of course the “carnaval”. Despite that locals our age prefer carnival parties in Lapa to the famous parade in the Sambódromo, we had to go see this spectacle first hand. Thus we dressed up appropriately ridiculous and made our way there. For those who forget to buy tickets in advance, our advice is to team up with a local who knows whom to ask in some darker street in order to arrange some tickets at a fair black market price. The atmosphere in the Sambódromo was hypnothising, as were the costumes and passionate carnival dancers. We stayed at the Sambódromo till the break of dawn, and left only when we were exhausted enough from all the impressions and sambamoves to make sure we would sleep during most of the busride the next day. It took us to São Sebastiao, the port to Ilhabela. Where to sleep: Copacabana Sol Hotel – friendly staff, perfectly located and great breakfast. Where to enjoy: Luciano Drinks at Ipanema beach – they make the sunset even more stunning. Where to eat & drink: Bar do Minero in Santa Teresa for a typical dinner. 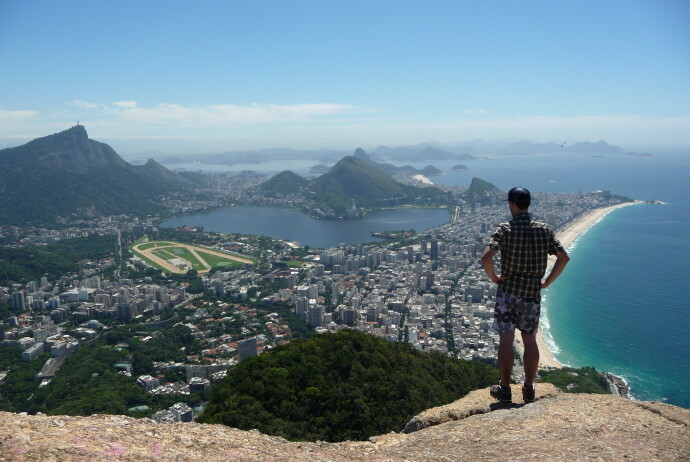 What to do in Rio off the beaten track: Hike to Trilha Dois Irmãos – an amazing view point that is definitely worth the effort. 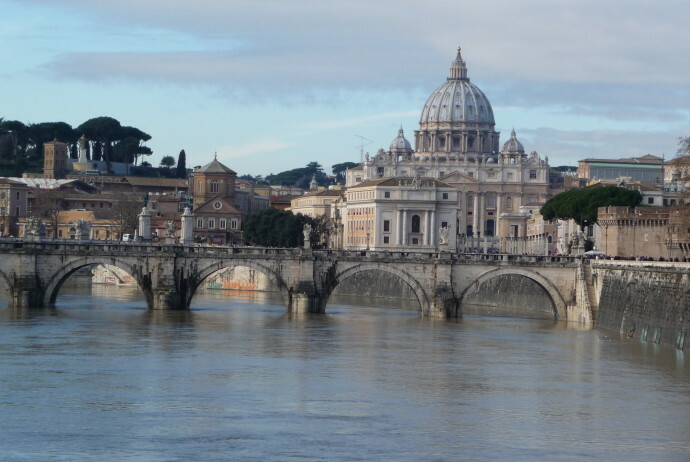 Our journey began with an overnight train ride from Innsbruck to Rome. To add some adventurous touch from the start, we opted for a regular cabin instead of a sleeping one. Nevertheless, time passed fast and soon we could enjoy a typical “Italian breakfast” with a really “grande capuccino” and a delicious “brioche con marmellata” but in a very unitalian way: sitting down, like only “people from the North” do, according to our hotel host Gianluca. Afterwards our discovery tour of Rome started. We explored the city only on foot, already in our South American hiking attire which attracted quite some suspicious glances from fashion-conscious Italians. No need to take the metro here: the real charm of Rome is found in all the tiny alley ways and there are a myriad of fascinating ruins found in between the main and most known sights. Where to sleep: Yes Rome B&B – a great option for backpackers. Where to eat & drink: An Italian coffee at La Casetta della Madonna dei Monti – a cozy place where great drinks and snacks meet Italian hospitality. Homemade pasta and pizza at Taverna de Pasquino – a wonderful restaurant for a typical Italian dinner. What to do in Rome off the beaten track: Giardino degli Aranci – a fantastic place for a scenic view over the city.